It is membership renewal time again. Until such time as the VKR devises an user-operated online membership portal, I have to submit all memberships manually. ...you need to email me a.s.a.p. to let me know your intentions. I will only renew your membership if you are currently training, or if you get in touch with me before 27 June. NOTE 1: it is not necessary to send any money at this stage. The VKR will invoice me for the total amount when they process the application. 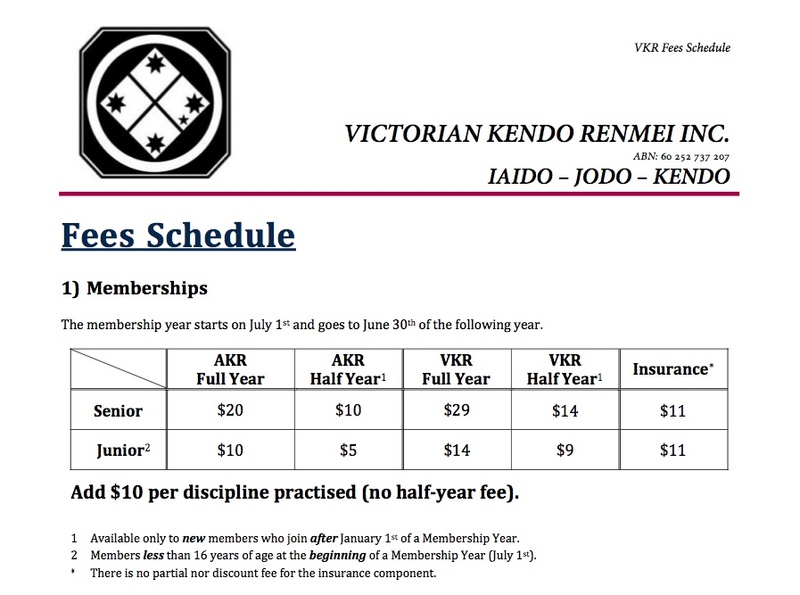 Above is the schedule of fees and how they break down for each art in the VKR (Kendo, Iaido, Jodo). The way it works is: AKR fee + VKR fee + discipline fee + insurance = total due. For example 20 + 29 + 10 + 11 = $70. This is the amount payable for a full year, adult membership of someone who practices only one of the three disciplines. An adult who practices Kendo and Iaido will pay $80 and so on.